Kalusion’s Wellness Chatter is a free 20-30 minute tele-chat (or teleconference) on different topics related to natural and healthy living. This forum offers a recap of our previous chatter. Next time join us for the chat and get your questions answered. Check in at www.kalusion.com for more info and to register. It’s that time of new beginnings, and for so many the goal becomes about weight loss. Not surprising after a holiday season of indulgences for so many of us. So what can we do to stay on track this year? Sugars are the root of many health problems. They create inflammation in the body, which wears down the immune system and leads to long term disorders such as auto-immune disorders, pre-diabetes, and diabetes. When I tell people to get rid of the extra sugar in their diet, I often hear I don’t eat a lot of sweets, I just drink three glasses of wine at night. Ahem, that’s sugar. Just because you don’t eat a pastry every day does not mean you are not eating sugars. Anything that your body immediately converts to sugar and spikes your blood sugar should be considered a sugar in your diet. This includes processed flours, alcohol, juice (eat the fruit instead), and processed foods that contain added sugar (they all do). Heck no. Sugar is more addictive than cocaine, and indulging only makes you crave it more. So getting started can be tough. Want to know how I do it? 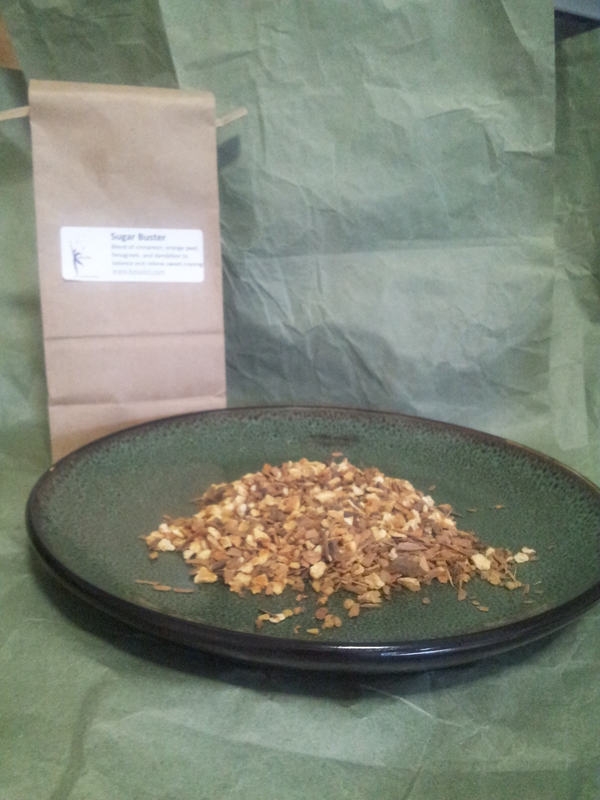 Ok, shameless plug here: I use my Sugar Buster Tea. I know, I know, I’m plugging my product, but guess what, it works. I made it to balance my system out and help with the cravings when I needed it, and I continue to use it now, most recently after Christmas to get rid of the cravings after devouring holiday cookies for a few days. The tea cleanses the liver, balances the blood sugar, reduces cravings, and fights symptoms of candida. It actually worked for me, and then I offered it to my friends, and it worked for them, so I started offering it to everyone. I have also created the Sugar Buster Body Oil to complement the tea for a total inside and out health kit. The body oil fights candida symptoms, and helps break addictions. My recommendation is to use the body oil daily after bathing, and to make the tea daily at a regular time or about 30-60 minutes prior to the time you usually crave sweets. I know that once the sugar monster starts screaming at me I often don’t want to do anything about it other than eat goodies even though the answer is right there. If I drink the tea prior, it doesn’t become an issue. Find Sugar Buster Tea and Oil here. Getting rid of the sugars is one of the best ways to see the difference you are making in your weight loss goal. After even a week of dropping sugars from your diet, you will notice less bloating in your body giving you a more streamlined appearance. Do you have to do it all at once? Of course not. As with any goal make smaller goals to reach that goal. This will help you see your successes and not give up on yourself. Cleanse your system of all the build-up of undesirables that may have collected. This is actually an easy one. Drink lemon water. It is best to drink warm or room temperature lemon water first thing in the morning to get maximum results. However, drinking lemon water any time throughout the day will offer you benefits. I have been making a glass jar of filtered water and lemon slices every day, and just drinking from it throughout the day. This is also a great way to see how much water you are taking in every day. We have all heard how important physical activity is for shedding weight. However, I may verge off path a little with my advice. I’m not going to tell you to do a certain amount of minutes of specific activities a number of times per week. So many people get turned off by physical activity because they make it into a chore. I suggest you do the things you enjoy doing. Go for a walk, a bike ride, play with the kids, work in the garden, dance around the living room. Essentially, do the things you enjoy then you will continue doing them without effort. You will find that if you don’t do it one day, you will actually miss your activity. I know people that turn on the music while cleaning the house, and dance around. That’s two birds with one stone. Find ways to incorporate it into your daily routine: park at the back of parking lots, and walk, stretch at your desk, go for a walk on your lunch break. Sneaking in even just a couple of minutes many times throughout the day will add up and provide you so many benefits. Products? Yes. Many people will clean up their diet, and find physical activity, and still struggle to see results. We can thank hormones for that. Doing the first three steps will help that endocrine system; however, the toxins we introduce to our bodies on a daily basis through our skin may undo all that hard work. Your skin is actually a more direct route to your body’s health. Consider when you eat, the food has to go through your entire digestive system before entering the blood stream. When you apply it to your skin it goes directly to your blood stream. Most of the products on the shelves contain toxins that disrupt your endocrine system, and throw your hormones out of balance. When reading the ingredients on your personal products you should be able to recognize and pronounce everything as you would when reading food labels. If you can’t, you may want to consider replacing that product when you finish it. Time for another shameless plug: Ava Anderson Non Toxic products have come to our home, and we are so pleased with them. They don’t just make claims about their ingredients; you can actually read the ingredients and see they are what they say. Plus the stuff actually works. I can go on and on about how great our Ava products work. Feel free to ask me, and I will. Check out Ava Anderson Non-Toxic products here. If you fall off track, you don’t have to wait until January 1, or Monday or next month to start again. Every moment is a new beginning, just pick up and start again. You are a wonderful person, and should never give up on yourself. I’d love to hear your stories of triumph and struggle. Let me know how your journey is going. This entry was posted in Uncategorized and tagged achieving goals, aromatherapy, auto-immune disorders, boost immunity, candida, cleanse, cure sugar cravings, detox, diabetes, functional fitness, health, hormones, improve physical health, non-toxic products, pre-diabetes, sugar, sugar addiction, toxin-free, wellness. Bookmark the permalink. ← Et tu, Burt’s Bees. Why I Decided to Join the Ava Anderson Team.